Before discussing the migrations of additional peoples in relation to Book of Mormon geography, I would like to note that the configuration of lands anciently was not the same as it is today.After the Flood, for example, it took a long time - perhaps hundreds of years - for so much water to recede from the face of the land (see Ether 13:2). In addition, at the time of Christ's death there occurred tremendous upheavals that changed the appearance of the land significantly. Many eminent cities of the Nephites sank under the sea, new mountains and hills rose up, new valleys came into being, and the whole face of the earth became deformed compared to what it was before (see 3 Nephi 8:9- 18; 9:4-12). The book of Ether records that in their later history the Jaredites "built a great city by the narrow neck of land, by the place where the sea divides the land" (Ether 10:20; emphasis added). This indicates that at one point a section of land was separated from the mainland close to the narrow neck of land. The area of San Andreas Tuxtila could well be the area of land that was separated. Historically La Venta, an early Mulekite site, is represented as initially being an island. 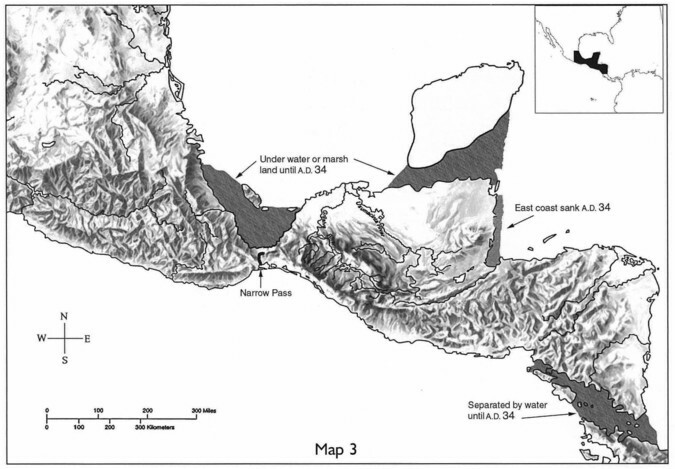 This separation of land could have therefore extended from San Andreas Tuxtla to and past La Venta (map 3). This topography of Central America - of a land divided by the sea - agrees with the way King Limhi's men described the land that the Jaredites had inhabited, some of which was still under water. They told about discovering numerous ruins of buildings and bones of men, which lay northward in "a land among many waters" (Mosiah 8:8, emphasis added). The expression many waters in the Book of Mormon refers to the waters of the sea (see 1 Nephi 13:10-17), as it does in the Old Testament (see mayim rabbim, "many waters," Isaiah 17:12-13). Land being among the waters of the ocean is a precise description of this land. Sections of land were actually dispersed among the waters of the ocean. In fact, an ancient Hebraic meaning of the term ca-mr-ah is the equal mixture of land and water. This area I have been describing, one of water-covered land or marshland extended from the city of Tampico, across the Isthmus of Tehuantepec, and up to the Laguna de Terminos, at the base of the Yucatan Peninsula. This area was called Tlapalco, which in the old Nahuatl language means "wet or flooded land" (map 4). This wet or flooded land extended three-quarters of the breadth of the Isthmus of Tehuantepec. It was the major reason the Nephites and Lamanites alike always accessed the land northward by way of the narrow pass, which was adjacent to the west sea. The land on the Caribbean side of the Isthmus was too wet and/or muddy to be traveled safely. Even if it was dry enough at times, if it were to rain during your crossing, you were "dead in the water." An army or large group of people would never have tried to cross the Isthmus on this side. 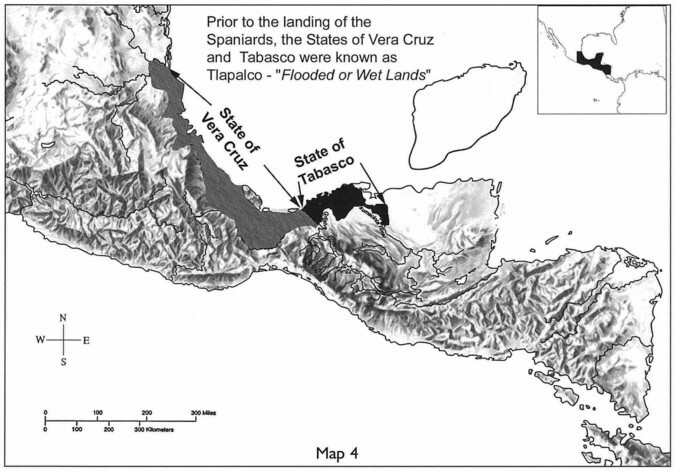 When the Spaniards arrived in what is now called Veracruz, they named half of this wet area (from Tampico to the Isthmus) the state of Veracruz. The remaining section of wetlands (from the Isthmus to the Yucatan) was named Tabasco, which has the same meaning as in the Nahuatl language: wet or flooded land. Eighty percent of the state of Tabasco is surrounded by wetlands or water (see Diccionario Geograjico Historico y Biogrdjico de los Estados Unidos Mexicanos). These were lands among the waters of the ocean, which is precisely how Mosiah 8:8 describes the land. A Different Configuration of Lands Because the Flood was fresh in the Jaredites' memory, they migrated to mountainous areas after they landed. Their subsequent settlement of the lower parts of the land-which became the "land among many waters"-was probably influenced by that land's greater fertility as well as by political considerations (see Ether 9:3). By the time of their destruction, the Jaredites occupied both areas, as their final history shows. The book of Ether records that not long before the end "the whole face of the land northward was covered with inhabitants" (Ether 10:21; emphasis added). A later time and place in the book of Mormon also sheds light on the configuration of lands. In reading that book, one may wonder why the Lamanites, as they multiplied, did not go southward to inherit the land. So far as we know, South America was primarily unoccupied, except for a few primitive cultures. Instead, the Lamanites ever sought to dispossess the Nephites of their lands, which lay north and west of the lands the Lamanites occupied. There were undoubtedly more than just political and religious reasons for the Lamanites' push northward. Today, a number of small countries lie between southern Mexico and Panama, namely Belize, Guatemala, El Salvador, Honduras, Nicaragua, and Costa Rica. 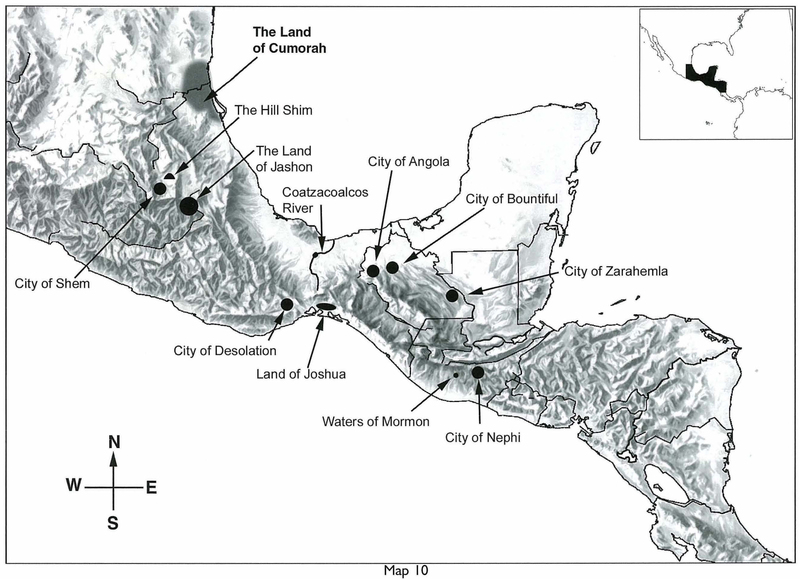 There are reasons for believing that the mostly highland areas of southern Guatemala, El Salvador, Honduras, and Nicaragua constituted the "land of Nephi" in which the Lamanites lived. 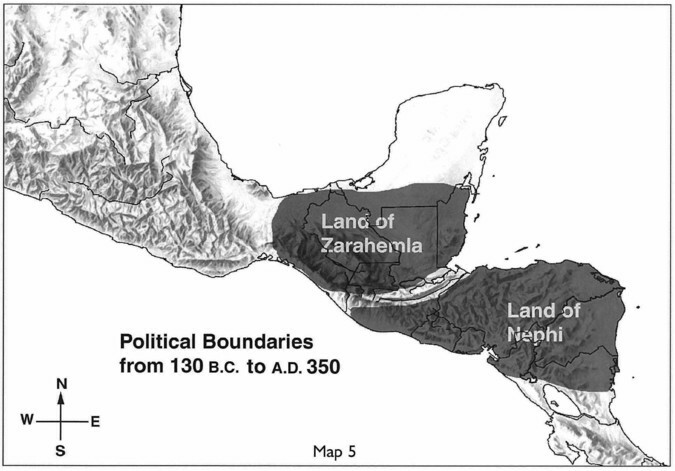 The lowlands of southern Mexico, northern Guatemala, and Belize, on the other hand, constituted the "land of ZarahernIa" and its environs, as abundant evidence attests (map 5). In Nephite times, both of these areas together were virtually an island. 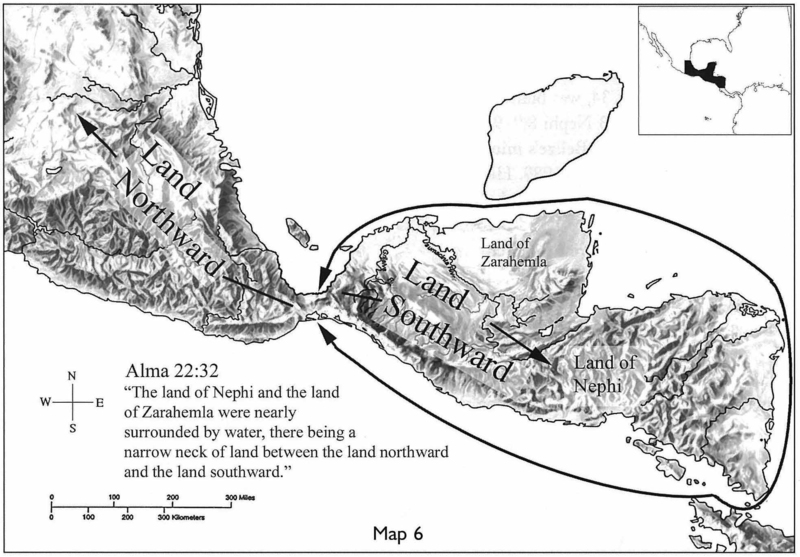 Alma says that the only thing keeping the lands of Nephi and Zarahemla from being completely surrounded by water was the narrow neck of land (the Isthmus of Tehuantepec), which led to the land northward. He says, "The land of Nephi and the land of Zarahemla were nearly surrounded by water, there being a small neck of land between the land northward and the land southward" (Alma 22:32: emphasis added; see also map 6). Alma's description of the configuration of lands thus makes a Lamanite expansion into South America unlikely. Perhaps that configuration of land also led Nephi to say--five hundred years earlier--"we are upon an isle of the sea" (2 Nephi 10:20). Another possibility for the water surrounding the southernmost part of the land concerns the boundary between Nicaragua and Costa Rica. In Nephite times, even that area may have been under water. Almost half of the boundary between the two countries today consists of water--lakes Managua and Nicaragua. The borderland between Nicaragua and Costa Rica is the only place adjacent to, and south of, the "land of Nephi" that is devoid of mountain ranges. That area was also considered as a site for Map 6 the Atlantic-Pacific canal that was ultimately built in Panama. I believe that this separation continued until the great topographical changes that took place during the Crucifixion, at which time the separation began to disappear during the upheavals of the land. After many years all that is left of this division are the currently very large bodies of water, the two lakes mentioned previously. A further difference in the configuration of lands concerns the shoreline of Belize, the country that lies on the east coast between Guatemala and the Yucatan Peninsula. Today, there exists a reef about ten miles off the coast of Belize. Archaeological data supports the idea that a portion of the area between the shoreline and the reef lay above water before the time of Christ. Early on in my investigations, I had concluded that the city of Moroni, which sank into the sea during the great upheavals of A.D. 34, was built near the coast of Belize (see 3 Nephi 8:9, 9:4). Esteban and I visited Belize's minister of archaeology in December 1989. He confirmed there was a "Mayan" city under water off the coast precisely where I had theorized. In fact, he told us, there are several cities under water off Belize. One is adjacent to the ruins of Cerros; another is further south. Evidence of these ancient sites under water can be ascertained by the presence of potshards that wash up from the sea on a regular basis. Some cities, in fact, lie only partially submerged. 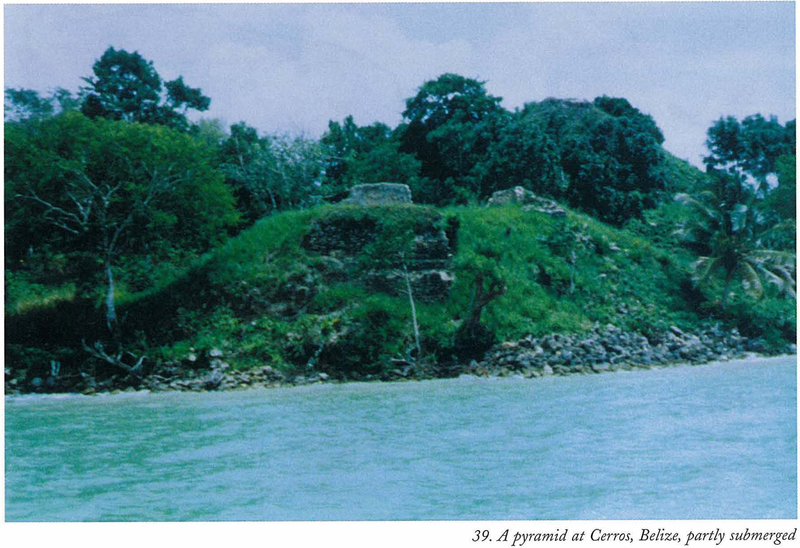 The ruins of Cerros, for example, exist on a small peninsula near Corozal, in the northern tip of Belize. The site runs to the edge of that peninsula and straight into the sea. 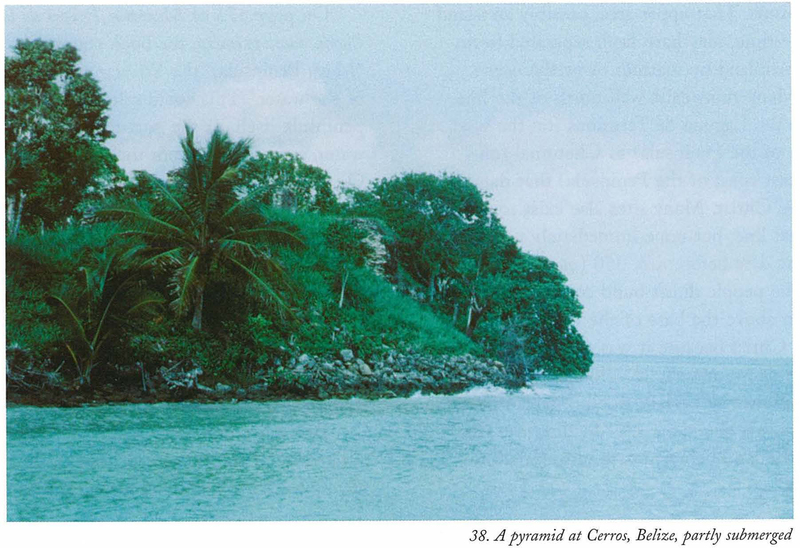 The top of one pyramid, adjacent to another larger pyramid, sticks out of the water (ills. 38, 39). 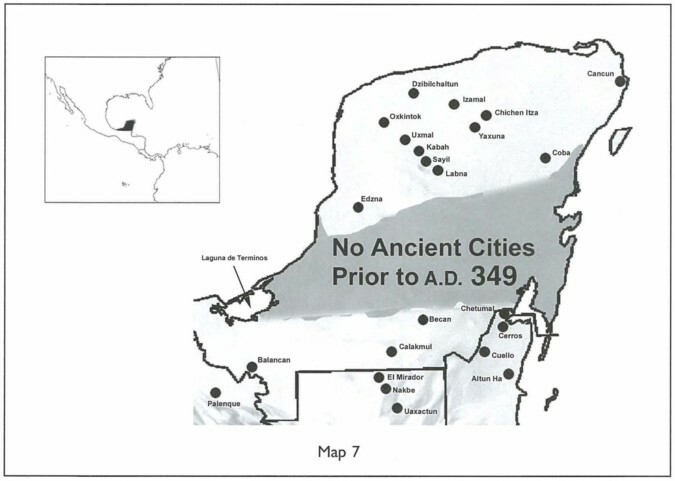 The minister of archaeology told us that a part of the city sank around A.D. 50, which approximates the time of the great upheavals described in the Book of Mormon. A perplexing thing about these underwater ruins is the resistance most archaeologists have to the coast of Belize's sinking into the ocean at that time. There exists evidence that the Yucatan Peninsula, too, underwent such changes. Geologists on the Peninsula told me a movement of land masses had certainly occurred. They contend, however, that it happened millions of years ago. Yet, we know there are "Mayan" cities under water off the coast of Belize. Unless these ancient people built cities in the sea, we must assume this land sank more recently than that. The Yucatan Peninsula extends into the Gulf of Mexico. From that gulf, the people of Enoch were translated into heaven together with the land in which they lived, as noted previously. Is it possible that the Yucatan Peninsula is the land that came up from the sea in the days of Enoch? So great was the faith of Enoch that he moved mountains, turned rivers out of their course, and caused the earth to quake. At that time, "there also came up a land out of the depth of the sea, and so great was the fear of the enemies of the people of God, that they fled and stood afar off and went upon the land which came out of the depth of the sea" (Moses 7:14). Eventually, however, all the people remaining upon this new land drowned in the Flood, which occurred three generations after Enoch (see Genesis 5:22-29). The Flood would account for the Peninsula's becoming submerged a second time. The Dresden Codex suggests that three "floods" have taken place thus far, with a fourth still to follow (cited in The Ancient Maya, 215). These floods are representative of four great destructions of peoples on this continent and coincide with the drowning of people in the days of Noah, the war of annihilation of the J aredites, the Lamanite victory over the Nephites, and the destruction of the latter-day Gentiles. I asked a geologist at the Sian Kan reserve in Cancun about the flat Yucatan Peninsula's having risen up from the sea. He said it happened on two occasions, both millions of years ago. However, no major ruins appear immediately above the base of the Peninsula until well after A.D. 34, which raises the question of its habitability before that time. On the other hand, evidence of human habitation predating Christ, such as petroglyphs in caves, exists in the northern part of the Peninsula. That upper area, possibly an island at the time, may have been separated from the mainland by marshes or by the ocean. Many ruins exist well north of the line from the Laguna de Terminos (on the west coast of the Peninsula) to Chetumal (on the east coast of the Peninsula) that date before Christ. Many sites also exist south of that line, but none immediately north of it that date before A.D. 350 (map 7). I assume people didn't build centers of habitation above the base of the Peninsula until after Christ because it was either under water or too marshy to colonize. Such a condition may explain Book of Mormon statements about the sea "dividing the land" and the land being "nearly surrounded by water." On page 173 of Mexico a Traves de los Siglos, tomo primero, the book states that the "Maya Peninsula," the Yucatan, came "out of the water." This could refer to the whole peninsula itself, or the part that was underwater, separating it from the mainland. On page 226 of the same publication, the Peninsula is referred to as an island. This historical document of Mexico, in its original printing, quotes ancient documents from this area and supports the thesis that the Yucatan Peninsula was submerged during the time of the Maya. In fact, this text states that the term Maya actually means to emerge from underneath the water. 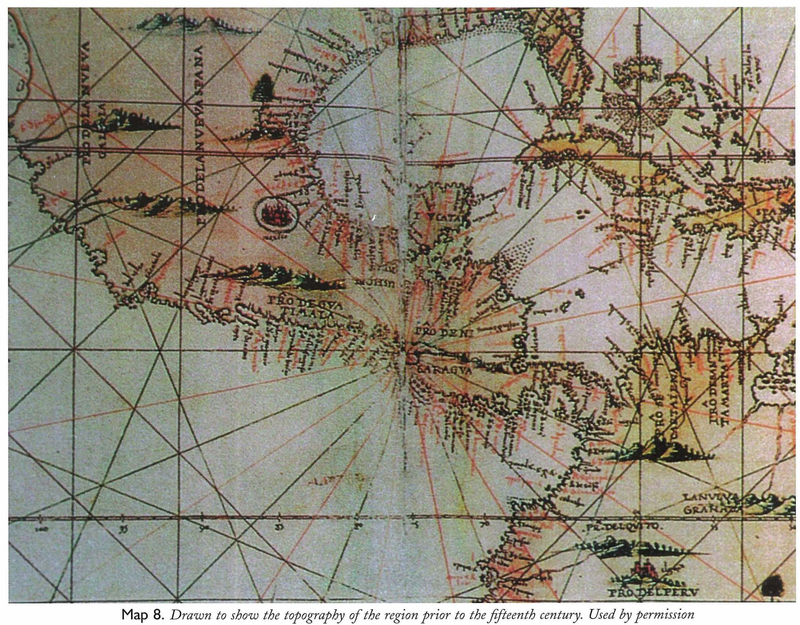 Two maps that were drawn to show the geography of this continent prior to its discovery in the fifteenth century are included in the Cartogrdjia Historica del Encuentro de Dos Mundos (maps 8, 9). These maps show the Yucatan Peninsula as being separated from the mainland. They were prepared for inclusion in this historical document celebrating the five-hundredth anniversary of the American continent. 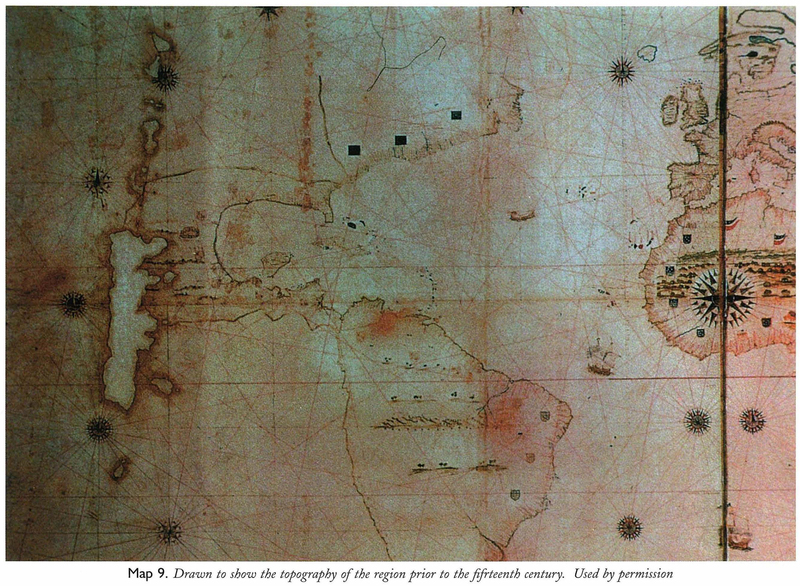 The shape of the Yucatan as represented in these maps coupled with the location of ruin sites, or the lack thereof, were used to estimate the shape and condition of the Yucatan peninsula prior to the Crucifixion. One last piece of information deals with snakes. Ether describes poisonous serpents that plagued the J aredites and their flocks (see Ether 9:31-33). These serpents were congested in the area of the narrow neck of land, or the Isthmus of Tehuantepec (see Ether 9:33; 10:19-21). Today, that area of Mexico is called Coatzalcoalcos, which means "Land of the Snakes" (see map 10). That land, from the mouth of the Coatzalcoalcos River all the way into Yucatan, is so well known for its snakes that the city of Cancun was named to reflect this-cancun means "snake pit." Click Here for the first part of Chapter 9 as it appears in the book. Click Here for the second part of Chapter 9 as it appears in the book.